A correspondent for Moskovskie Novosti paid a visit to the closed city of Zarechny — the most illustrative example of how to turn a gloomy Soviet legacy into a source of regional pride. Zarechny is one of ten closed “nuclear cities” in Russia. Typically, such settlements are more like military bases than modern urban centers. But Zarechny — population 65,000, a little over 7 miles from Penza — bucks the trend. In 2012, it won the prize for best urban practices, in a competition organized by the Agency for Strategic Initiatives (ASI). Together with volunteers, the local authorities of Zarechny are building a bike park, providing trashcans for sorted waste collection, working to improve access for the disabled, and, in general, devising ways to develop the town as part of a common mission. Moskovskie Novosti's correspondent tried to find out why all this is necessary for a city that lives behind barbed wire. Beyond the metal barbs lie clear roads, pine trees, schools with free meals, babushkas exercising at the side of a pond, children’s clubs, swimming pools, and tennis courts. Zarechny is a resort town for senior citizens and children, say the locals. “People ask what we’ll do when the barbed wire is removed. We don’t know, but we’re looking at options — which is why we set up the strategic development club,” said club patron Elena Enyutina, as she passed through a checkpoint. The head of the local administration and 80 percent of residents are against opening up the town — they are afraid of the unknown. “I am sure that if residents offered to chip in to keep the fence in place, everyone would agree. And we would remain a museum of developed socialism,” jokingly said Vladimir Kshumanev, head of public relations for the Zarechny administration. The strategic development club grew out of a business game. The manager of the club, construction company director Konstantin Pribylov, returned to Zarechny from Moscow, where he had worked for three years. “Everything here seemed so gloomy, something had to change,” he said. He shared his thoughts with Vyacheslav Gladkov, head of the Zarechny administration. In 2009, Pribylov brought urban strategies expert Sergey Zhuravlev and a team of specialists from the International Methodological Association all the way from Moscow to Zarechny. Gladkov summoned local managers and locked them all away for three days at the Zvezdochka pioneer camp. “I chose motivated people from different areas: the media, the public sector, factory workers, businessmen, pensioners, and brash youngsters. It was my choice and mine alone,” said Gladkov. “He made us turn off our cell phones, even though they were out of range anyway,” Pribylov said. He recounted that many had expected a banquet — they were all used to events finishing with a bottle or two. Instead, inside a cold room, they had been tasked with framing a strategy for the town. “After three days, I got the feeling that I had spent my previous existence lying face down,” said Gladkov. “We scoured our brains, looked at archetypal examples, and discussed the development of other cities — from the Canadian metropolis of Vancouver to Russia's provincial Myshkin,” Pribylov said. Three areas were slated for development. Each project was considered from three angles. First, “Zarechny is the best urban ecosystem” — ecology relates to the system under which all living organisms and the living environment interact, bringing together man, nature, and infrastructure. Second, “Zarechny is a creative park” — a closed city can be viewed as a creative cluster." Third, “Zarechny is Russia's engineering valley” — the city is viewed as a special territory, where technical services for the development of innovation and production and the optimization and upgrading of industrial relations are provided on a commercial basis. It was the next meeting of the club. Inside the business-incubator hall was a group of about 40 people; two of them were Gladkov’s deputies. Newcomers did not know what to expect from the meeting. Alex Kireev, a 24-year-old from the local auto club heard that “the club is, like, trying to improve the city without federal money.” These new faces had been brought in by old-timers at the administration, and social networks had attracted some others. Kireev, just like all the others, filled in a questionnaire in order to vote and present project ideas. The format of the meeting was as follows: a couple of speakers presented their projects; the projects were discussed; a show of hands was given from those willing to work on the projects; the takers are put into working groups. Palatkin also registered the project working on access for disabled persons, but the task of providing a feasibility study fell to a virtual member of the club. Real meetings take place once a month, while the rest of the discussions happen via the online Facebook group. The morning after the meeting, the online group discussed a letter to the head of the administration, regarding the introduction of buses for the disabled. People offered to install special ramps for the entire fleet of buses. 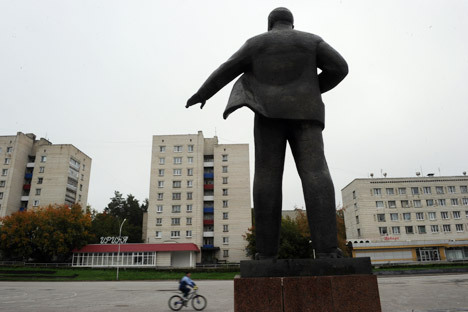 Alexei Kiselyov, a 32-year-old wheelchair user, wrote: “Such a maximalist scenario does not exist in any other country. Not to mention the fact that it’s an utter waste of money.” Kiselyov himself drafted the proposal for the access project." “I've been dealing with this problem for more than ten years. Wheelchair users like me have a registered organization, but its activity level is close to zero. When the topic was raised in the club, I was called in by a friend. The club provides a platform for people with ideas and for those who can implement them, as well as for those with a say in the decision-making,” said Kiselyov. All kinds of ideas crop up. The city administration liked the idea of creating a monument to the security pass that is required to enter the city. Officials were also interested in holding a moose parade in the city, similar to the cow parade in Ventspils, Latvia, where sculptures of cows line the streets. “It’s the little things that engender the right attitude to life. And to the city. The place would benefit from a bit of extra pep,” said Gladkov. In summer 2012, Moscow’s municipal deputy, Maxim Motin, suggested that urban dwellers and architects improve the square outside of an apartment block in the Pechatniki district, as part of the “UrbanUrban” project. The project was contingent on the mayor’s promise to hand over responsibility for landscaping to local deputies, but officials rejected the project. “We have opportunities elsewhere,” said club organizer Konstantin Pribylov. “I’m not an altruist. Zarechny has enough apartments now. I have four or five competitors here. I noticed that many developers in other cities have already started thinking about how to sell not only apartments but also a decent living environment. It makes sense to splurge on landscape improvements to take people away from our competitors,” Pribylov said, explaining his logic. He estimates that the project to upgrade the yard will cost 2.2 million rubles ($70,700). Forty percent of the apartments inside one of the nearly completed blocks have already been sold. The club — actual or virtual mode — includes around 300 members. Zerechny has a total of 64,500 inhabitants. The participants realize that many city dwellers know nothing of the club’s existence. Still, there are those who have heard about it and are dissatisfied. He believes that it is not necessary to go knocking door-to-door; rather, a system of management with no single person in charge needs to be established. Kosmach admitted that he lacks sufficient information about the club. “I have not seen a detailed description of the projects online. I don’t understand what they’ve been doing for three years.” He pointed to the sidewalk outside the “Rossiya” movie theater. “There was a huge hole here — a car fell into it. That’s the sort of problem that needs to be addressed, not bike parks,” Kosmach said.